Assembly at the Islamic Republic of Iran Interests Section, 2209 Wisconsin Ave NW, at 1:00 followed by a march at 1:30 to M St in Georgetown to raise public awareness about political prisoners and executions in Iran. In Iran, thousands of political prisoners endure unspeakable suffering on a daily basis. In Iran, the Islamic Republic executed an average of 2 people per day in the month of May this year. Approximately 200 executions have been officially reported thus far in 2011, although the actual number of executions is believed to be much higher. We do not tolerate the crimes of the Islamic regime in silence. 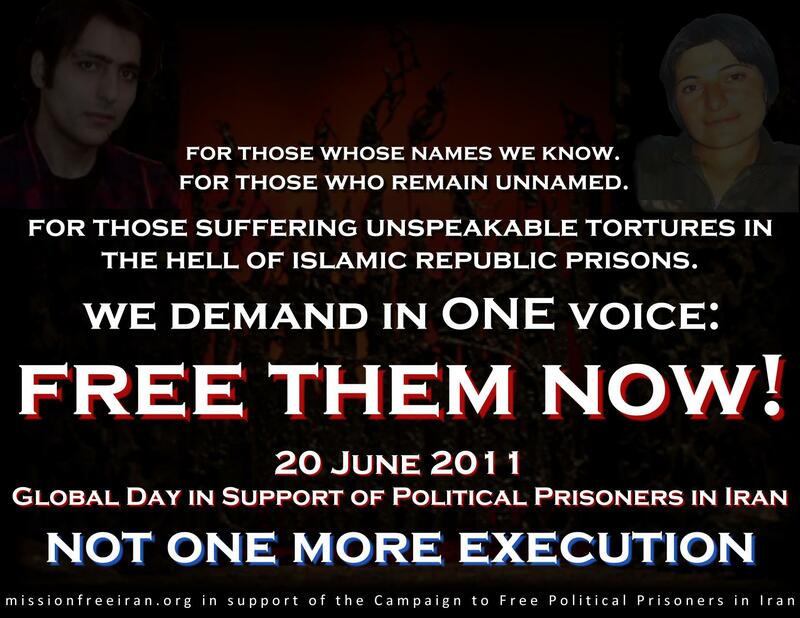 We Demand Immediate and Unconditional Freedom of All Political Prisoners in Iran. For more information, contact Monir (Farsi; monir86@gmail.com) or Maria (English; maria.rohaly@gmail.com; (240) 812-9234).